(Bloomberg Opinion) -- A hostile bid by a German predator for a U.S. target in a politically sensitive industry should have a snowball in hell’s chance of success. When the target has just agreed a friendly tie-up with a domestic peer, the likelihood dwindles further. Conglomerate Merck KGaA is therefore on the back foot as it tries to buy Tempe, Arizona-based semiconductor maker Versum Materials Inc. But the German suitor has one classic advantage: its cash offer has certain value; its target’s nil-premium merger does not. The situation puts a cross-border twist on a common risk in M&A: that one side in a merger of equals receives a generous counteroffer from a deep-pocketed rival. To recap, Versum agreed to combine with rival Entegris Inc. in January. The market cheered, pushing Versum’s shares up 31 percent to $41, for a market value of $4.5 billion. Merck, capitalized at $48 billion, said a month later it wanted to buy Versum for $48 a share in cash, or $5.2 billion. Its proposal was worth 52 percent more than Versum’s value before the Entegris tie-up was hatched, and 59 percent more than the company’s average stock price over the past three months. On the face of it, Merck’s proposal looked superior. Yet Versum’s board resisted, and shareholders have benefited from this stance. The interloper has turned increasingly aggressive, making its proposal binding on Monday. The target now has some real options. The price may be the same, but this time it is firm, which gives grounds for Versum to soften its position. The challenge is comparing the value of cash today with the promise of jam tomorrow. Under the Entegris tie-up, Versum shareholders would own just under half the combination and the resulting benefits. The market priced in that upside quickly. 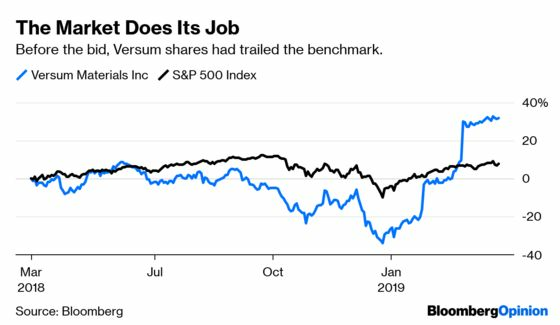 It’s hard to see how Versum investors’ near 50 percent share of the expected synergies can be worth more than the $1 billion increase in the company’s market value between the deal being revealed and Merck gatecrashing it. For shareholders to be better off with the Entegris deal, two assumptions must hold. First, that Versum and Entegris stock was undervalued ahead of the deal and will outperform in the coming 18 months or so. Alternatively, that the merged group is itself likely to receive a generous takeover offer in the near future. The two companies were worth a combined $10 billion before Merck popped up – so they are hardly too big to buy. In reality, if Merck’s offer had preceded the nil-premium deal, Versum would have found it hard not to engage. Entegris would have stood little chance. Merck can probably stretch a bit more, but not by much. Including assumed net debt, the all-in cost of the deal would be about $6 billion. To make a return matching Versum’s estimated 9 percent cost of capital, Merck would have to lift operating profit from an estimated $418 million this year to nearly $700 million. It’s plausible the German company could do that in the medium term: the $70 million of savings it has identified are almost certainly an under-estimate. Versum has a poison pill defense, allowing it to dilute a hostile bidder’s shareholding. But it may do better a job of pushing Merck to the pain barrier by talking. Otherwise it needs to present a proper explanation of why the Entegris deal is worth more.